Bali Rafting - ALAM Amazing Adventure know well as ALAM Rafting is a Bali rafting company on the Telaga Waja River is most popular river. Striking with a bright yellow color that is very easily recognizable. Amazing natural surroundings maintain Bali rafting dedicated to donating a percentage of income from this activity. Certainly, not only pleasure, a new experience, or a different atmosphere that you will experience, but you also participate to help sustain the environment naturalness Telaga Waja River area for your Bali Rafting Trip. What the Bali Rafting - ALAM Rafing activity look like? ALAM Amazing Adventure rafting provide quality service which is amazing. With ALAM rafting guides are professional and very experienced, will always keep and guide you through the Telaga Waja river wading along 16 kilometers. Flow and the clear waters of Telaga Waja River increasingly make your holiday will never be forgotten. Upon arrival in the location, you will be treated to appetizers beverages like coffee or tea and some snacks Balinese. Each participants are required fill out a form of insurance. After all filled, you will be invited to wear standard Bali rafting equipment such as helmet, paddle, and life jacket. Waterproof bags will be supplied by Bali rafting guides and you are welcome to put items that you will take over the river. Before starting Bali rafting, all participants will be briefed on the conditions around and some code that you must understand and follow during white water Bali rafting. In the middle of your journey across the river Telaga Waja for this Bali Rafting adventure, you will be invited to stop for a moment to rest while enjoying the view of a beautiful waterfall. Green landscape of rice terraces around the river you can also enjoy the same time. Here is your chance to take a picture through your own camera to capture this incredible experience. Shortly before the finish wading Telaga Waja river, you will plunge altitude of approximately 3.5 meters which is often called the "Bajing Dam". It is the most awaited of this journey through the Telaga Waja river. You will scream loudly as it passes through this place. Photographer of Alam Amazing Adventures will always be ready to capture your amazing Bali Rafting images as it passes through this place. What to bring to do Bali Rafting - ALAM Rafting? It was a wonderful experience and well organized tour ! Food could have been better but the guide and others assisting were efficient and very helpful! My husband and I booked the white water rafting. It was so good. On arrival we were well greeted with friendly staff, offered tea and coffee with some morning tea. As the numbers gathered we were placed with our rafting guide “tiger” who gave us his instructions to follow during our 2 1/2hr rafting adventure. 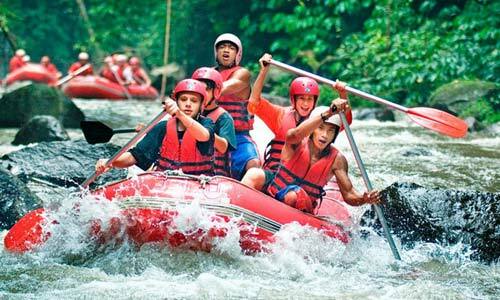 We decided to do the white water rafting in Bali and got recommend from Anom to pick this company. Not regret it at all. It's feel fantastic from the start- picked up on time until finish the activities. Good safety equipment, professional guide and lots of rocks and obstacles on the way down. Thanks Bali Tours and Anom for his suggestion.